Air-fill two red Qualatex® I Love You latex balloons to 9". Tie together to form a duplet. Create a second duplet of the same. Twist the two duplets together at the knots to form a four-balloon cluster. Tie this cluster to the balloon weight. Air-fill two white Qualatex® 6" heart latex balloons. Tie together to form a duplet. Create a second duplet with two pink Qualatex® 6" heart latex balloons. Twist the two duplets together at the knots to form a four-balloon cluster. Use the adhesive tabs to connect the second cluster to the top of the first. Make 4-four-balloon clusters with the white 5" latex balloons. Air-fill the four Candy Heart foil balloons. 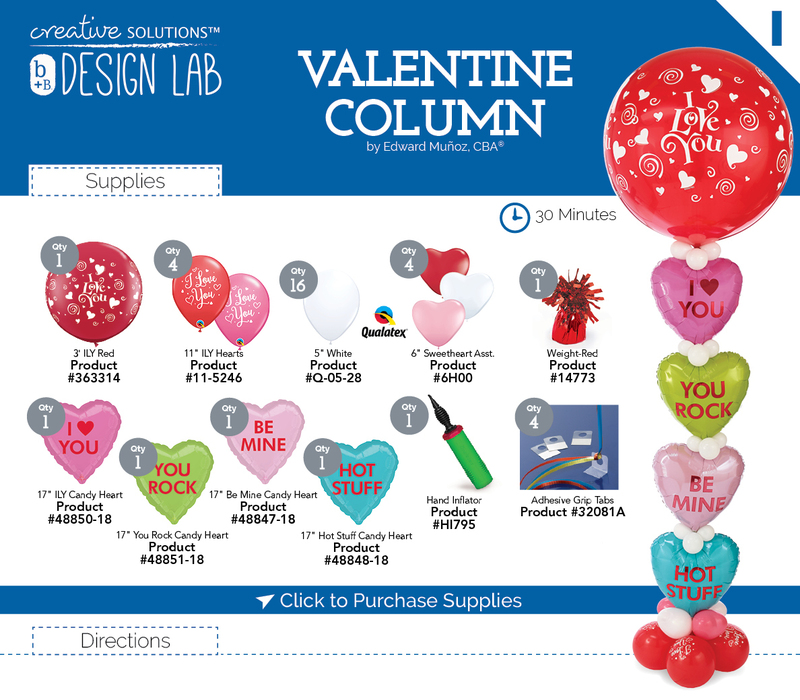 Continue the column by attaching the Hot Stuff Candy Heart balloon to the first two clusters using the adhesive tabs. Then next a 5" white cluster, Be Mine Candy Heart, white cluster, You Rock Candy Heart, white cluster, ILY Candy Heart, and the last white cluster. Now, inflate the 3' ILY Red Latex balloon with Helium and tie to the topmost white balloon cluster for a topper.